These simple vegan donuts are light, chewy and moist. The perfect treat! Use food dye to color your icing and get creative with the toppings! Preheat oven to 350. Grease the donut pan with non-stick spray, such as coconut oil spray. In a large heat safe bowl, melt the Earth Balance with the next 4 ingredients over the stovetop. Mix in the sugar with an electric mixers, creaming all of the wet ingredients so there are no lumps. In a smaller bowl, stir the flour, baking powder and salt together. Start adding the dry into the wet while keeping the electric mixers on a low setting. When the batter is smooth and all the ingredients seem fully incorporated, fill each donut indention with the batter ALMOST to the top of the brim. Maybe half a centimeter from the top. Bake for 11-14 minutes (mine took 13). Let dry completely. While those are baking, combine the powdered sugar, vanilla and 1/4 cup coconut milk. Use the electric mixers once more to create a smooth icing. Add more coconut milk to create a glaze. Otherwise, start with the 1/4 cup coconut milk and if it needs more just add little splashes at a time to your desired thickness. 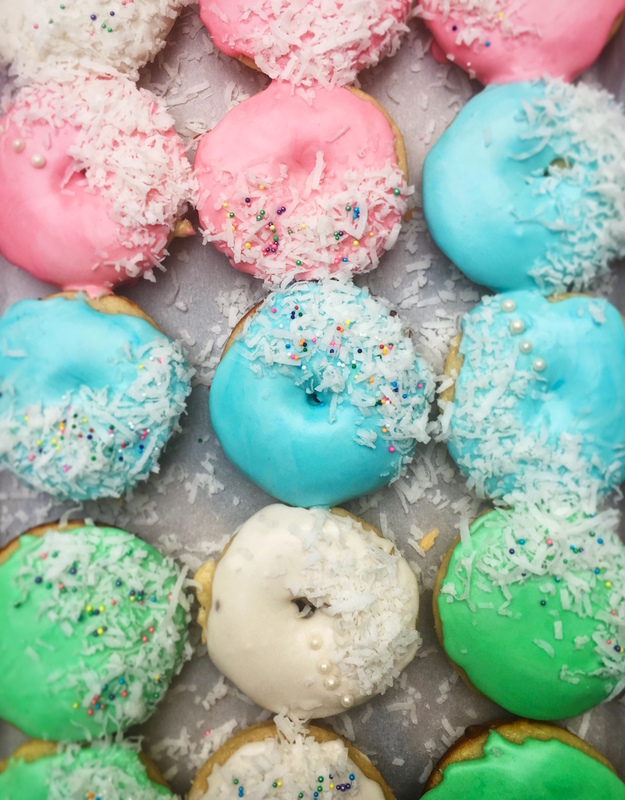 Ice each donut and top with coconut flakes and sprinkles.